Shortly after passing the 650,000 users mark we launched Redbooth and renamed the company. The new version had two goals in mind: speed and ease of use. We employed a team with twice as many developers and designers to work on it. We hired specialized sysadmins to run the systems and make sure everything works perfectly. Redbooth is built to serve millions of users, with a platform that processes tens of millions of collaboration activities. The name ‘Redbooth,’ a sly nod to the iconic, crimson telephone booths found throughout Britain, is indicative of the company’s strong focus on communication and cooperation. What do you do in a phone booth? Make calls; talk to other people; communicate. Redbooth’s inherent mission – “to provide a single place for organizations to collaborate and get work done” – has resulted in a unique product that merges task management features, file sharing, and live collaboration tools. And with dedicated workspaces chat and a bevy of commenting features, as well as new experimentations in smart technology, it is safe to say Redbooth wants teams to be talking to each other. This approach seems to click with customers. In the last three years, Redbooth’s revenue has rocketed over 500%. With dual offices now in Barcelona and Redwood City, and 70 employees, it is hard to argue with the success of a company that boasted just three employees eight years ago. Even more compelling, though, are the big names who attribute much of their own effectiveness to Redbooth’s platform: American Red Cross, Starbucks, Griffin Technology, and such Education Institutions as Harvard University and Indiana University. Redbooth offers both cloud-based and on-premise services. The Redbooth web application works best with the most updated versions of Internet Explorer, Chrome, Firefox, and Safari. Obviously, there is no risk in signing up for the free trial, and you may do so at any time. Sign-up takes roughly 60 seconds, in my experience, and is an easy process. My free trial allowed me to use all of the features on Redbooth. You can upgrade or downgrade your account at any time; if you happen to upgrade during the middle of a billing period, your subscription will be prorated. Redbooth accepts payment in the form of Visa, MasterCard, American Express and Discover cards. They also support other payment methods such as a check or bank transfer. Plans can be billed either monthly or annually. Quick-Add: With the Redbooth quick-add feature, you can create multiple new tasks in your workspaces by quickly typing in the task name and hitting enter. Details, if you wish, may be filled in later, but it’s a good way to get ideas out of your head and into a more permanent format. Tagging & Other Shortcuts: To increase the speed and efficiency of your work, you can take advantage of several Twitter-like social media shortcuts. For example, any single user can be flagged with the @username command (or @all, if you want to tag everyone). You can also update task status using hashtags (like #resolve, #hold, or #reject), tag tasks for context (#client, #feature, #bug, or #launch) or use them to indicate priority levels (#p1, #p2, #p3, and so forth). Timeline View: Gantt Charts allow you to see the interconnected and overlapping tasks in your projects, laid out in the form of a timeline. I personally don’t find this view particularly useful, but many people love Gantt Charts because they help you to quickly visualize which group members are assigned to which tasks. Workspace Group Chat: Having a workspace-specific group chat readily available is a really handy feature of Redbooth. Most programs I have seen make you go to a separate screen to access the group communication system. In Redbooth, the chat function is just always there when you are in the workspace. Mobile Apps: Installing the iOS app on my phone is as easy as it should be, and most features from the web-app are instantly available (though in a simplified view). A few features are limited in the mobile application; certain things, such as notes, cannot be edited on the app. The most conspicuous absence, though, is the timeline view. While some might see this as a deficiency, I enjoyed the simple interface of the app. Unless you plan on doing serious work on your phone, it should be absolutely sufficient. It looks like there are a few issues with the Android App that are not present on the iOS version, but Redbooth’s customer support seems present on the Android store and looks to be actively trying to resolve issues reported there. Direct Support: For questions that cannot be answered easily by online support material, or for those of you who simply prefer a more personal touch when solving problems, assistance is always available by email. As a rule, Redbooth strives to answer questions within 24 hours, but it’s typically much quicker than that (Business users are given priority). If your problem happens to be complex or hard to articulate in writing, you can include a phone number in your email and request a call back from a member of the service team. Webinars/Online Tutorials: Happily, Redbooth has provided users with several very good pre-recorded tutorials and webinars. “Redbooth 101 – Mastering Online Collaboration” offers an especially thorough, detailed approach to the software, and introduces most of the primary features in a way that is both compelling and educational. There is also a pre-recorded webinar for more advanced Redbooth users and a Spanish-language beginner’s tutorial. Most of these tutorials are 20-30 minutes long, but they’re well worth the time investment, in my opinion. If you’re interested in participating in a live tutorial session, you can find more information about upcoming webinars on their website; registration is completely free. If you can’t find what you’re looking for in these webinars, or simply want a more personalized look at the software, you can contact Redbooth support for a custom demonstration. Knowledgebase: This handy help section contains a series of written tutorials to help you answer simple questions, navigate Redbooth’s many features, and troubleshoot some of the more common problems. One of the best things about this knowledgebase is its prominent use of large, clearly labeled screenshots. Overall, I think it is a good reference tool that could – in many scenarios – save users from the hassle of contacting the support team directly. Feedback: Wisely, Redbooth has made it possible for users to submit critiques and suggestions for how to improve the service. Blog: The Redbooth blog is a good source for general project management tips and information about product updates/planned changes. Social Media Engagement: The Redbooth Facebook page is updated occasionally, but sometimes months go by without new posts. Their Twitter feed, on the other hand, is checked and updated frequently. Customer questions are also directly addressed there. In general, a great place for information on Redbooth is their website’s Resources page. Here you will find the webinars and tutorials mentioned above, as well as a bounty of other information in the form of eBooks, slideshows, and infographics. No Budgeting Features: The ability to set and track budgets for your tasks is a critical feature of advanced project management, and one of Redbooth’s most noticeable lacks. No Rebranding: Many companies allow users to customize their own logos, color schemes, and layouts. Redbooth is not one of them. What you see is what you get, as far as the visual appearance of the UI goes. Template Issues: While not a complaint I have found much online, I personally have become frustrated by the lack of flexibility in Redbooth’s template system. Currently, the only templates you can add are task lists, which can be frustrating if you want to add a template task (with subtasks) to an established list. You can work around this by making a new task list, then drag-and-dropping your task into your old list, but that is way more steps than is convenient. Excellent Collaborative Features: Users say that Redbooth helps them interact and cooperate on a higher level. Bonuses like email integration and group chat have helped many businesses streamline communication and eliminate pointless meetings. Low Price Tag: Redbooth has the potential to save an enormous amount of money, and not only because it significantly undersells most of its competition. Though inexpensive on its own, this software also offers a wide variety of integrations, helps to increase productivity, and provides features (like task list templates) which eliminate wasted time and movement. Great Integrations: It’s rare to find a company that has spent so much time and effort developing practical integrations for its software. Redbooth doesn’t just piddle around with standard integrations like Outlook and Google Drive. They’ve also invested in great, unexpected integrations with other programs – Slack, Evernote, Github, and Zendesk, to name a few. You can even integrate with specialized project management programs like Pivotal Tracker. Intuitive UI: Redbooth has clearly spent time and effort developing a smooth, easy-to-use interface. People rave about the simplicity and elegance of this software and appreciate its negligible learning curve. It should be noted that since we last reviewed Redbooth, one of the more common complaints about the program – the structure of the pricing plan – has been remedied. Another criticism from our last review was that there was no way to create dependencies in Redbooth. This deficiency has also been remedied via the Gantt Charts in the timeline view. Good on Redbooth for listening to their users! The Redbooth On-Premise solution offers a way for many organizations to quickly deploy within existing security practices, standards and infrastructure. We evaluated over 20 business collaboration tools including SharePoint, Huddle, Asana and Basecamp and found Redbooth to be the most intuitive and comprehensive platform available. Redbooth goes beyond a ‘tool’ bringing together all of the business applications we use in one centralized location allowing us to get more done with better accuracy and efficiency. Redbooth is an integral part of our organization. It has changed the way we communicate with our clients, staff and vendors. It is truly revolutionary and has save us time and money. Our customers, staff members and vendors love Redbooth. The integration of Box into the Redbooth platform takes Box to a whole new level. Having integrated tasks, discussions, calendaring and Group chat in one centralized location has increased our productivity tremendously. Bottom line, we get more done with Redbooth. Redbooth may not be a true one-program-fits-all application, but what it does, it does as well or better than any other project management platform I have seen. It is true you will not find budgeting tools in Redbooth; neither will you find the kind of robust personnel allocation functions that some other programs offer. However, I think that when it comes to team communication and task managing, Redbooth is second to none. Tasks: As you might expect from project management software, Redbooth allows you to create tasks and assign them out to your team members. Unlike some of its competitors, Redbooth also allows for the simple creation of subtasks, the better to break down large chunks and get things done. Tasks can be set to be due at a certain time or to repeat. Recently, Redbooth added the capability to assign more than one person to a task, thereby addressing one of the biggest complaints about their product. Conversations: This is easily my favorite part of Redbooth’s workspaces. Conversations can be reached by either the left-hand column or the dedicated tab on each workspace. Obviously, you can use this feature to talk with your group members, but there is more to it than that. Because Redbooth integrates with the likes of Box and Google Drive, team members can share their documents directly into the conversation and view them no matter their preferred software. Redbooth makes the documents easily viewable to all. Better still, if through comments in the conversation window it becomes clear that a new task needs to be added to your lists, you can turn a comment directly into a new task. That kind of functionality makes it clear that Redbooth is concerned with providing a smart, user-friendly product for their subscribers. Timeline View: As I mentioned above, this is where you can access a Gantt chart view of your workspace. The great thing about Redbooth’s Gantt charts is that they really are just another way of looking at your workspace. Any changes you make to the Gantt chart, whether it is adding, reassigning, or modifying tasks will be reflected in the workspace immediately. Reports: Redbooth’s reporting capabilities allow you to quickly analyze all facets of the program. You can choose to look at each workspace and check how many tasks are late, on time, or not yet begun. You can do the same with each user, making sure no one is overbooked. It is nicely structured and easy to use, just like every other feature in Redbooth. Advanced Tags: After months of working on a new tagging feature, Redbooth has released their advanced tags. 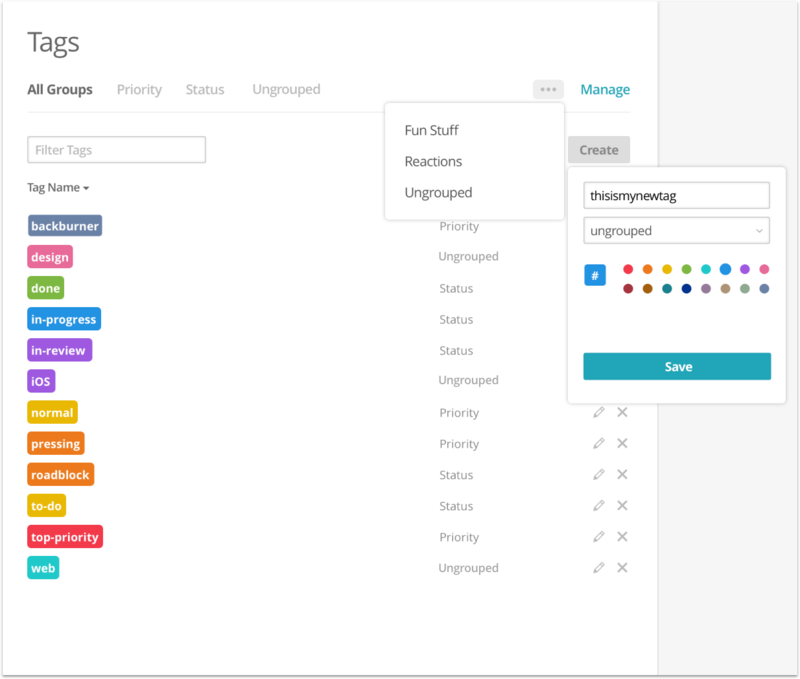 A highly customizable system of tags allows you, the user, to sort your tasks in ways that make the most sense to you. You can have Priority tags (communicating the level of importance of the task) and Status tags (communicating how close they are to done). I like the system, and it sounds like Redbooth will see more development with it in the near future. Redbooth also has an extension called “Redbooth Timer” that allows users to log time on various tasks quickly and easily. If your favorite integration is not available, Redbooth has an open API and is ready and willing to work with you to make sure you get what you want out of their product. Vigilant Monitoring: Both the Redbooth servers and data are carefully monitored 24/7 for intrusion detection and availability, with a special emphasis on maintaining 99.9% up-time. Restricted Access: There are strict controls overall physical access to the Redbooth servers; the servers themselves are fully protected with power redundancy, temperature controls, and fire detection systems. Safe Connections: Redbooth guarantees a secure connection at all times. Customer data is encrypted for transfer using SSL and is accessible exclusively via https (HTTP is never used). It should be pretty clear by now that I really like Redbooth. Everything about it basically clicked with me as soon as I started to use it. The focus on communication between team members is well executed, clean, and smooth. Task creation is a breeze either in the task list tab of your workspace or the handy “create” button. The fact that you can even turn conversations into tasks further highlights how well thought-out this program is: as soon as new ideas arise between group members, they become tasks. There is no clunky clicking around to get to the task page, just immediate creation. It turns thinking into doing with an ease I have not seen before. If there is even the slightest chance your team could benefit from using Redbooth, I highly recommend giving their free trial a shot. There is nothing to lose by giving it a go and finding out how much it has to offer your team. Even if the lack of budgeting features is a concern for you, the fact that Redbooth has an open API means you can customize it to fit your particular needs. I cannot recommend it more highly. Have you ever lost your password and had to use support to regain it? With redbooth and your an admin, forget it, your account is deleted and another admin in the group HAS to restore you. Redbooth support washes their hands of it and is no help. Extension support, forget it, “we are working on that” can last up to 6-8 months. Warning: NO supported file backup service. I have been using the pro account for several years. I just tried to leave redbooth and needed to download all my data. Though they currently offer a backup service for what they term as ‘Premium data backup’ with the business account. Quite unbelievably this does not include physical files. ( word docs, pdfs’ etc) . The only download solution they offer for your physical files is to login and download files per project one by one. ( I currently have over 1000 files in folders and sub folders) NOTE: When I first signed up to the service ( as the brand teambox) it had a dropbox synch backup service. This was removed when teambox was taken over by Redbooth. Redbooth replaced this time with a file archive service ( which I can still link to but it no longer works properly, though they are currently refusing to admit this ever even existed. ) The only other alternative currently offered was a heavily advertised feature for box.com / Enterprise app integration. ( another upgrade in cost ) QUOTE: ‘Once you’ve synced your accounts, all files will be migrated to Box and will no longer be stored in Redbooth. ‘The problem with this: Neither Box or Redbooth support this app, once you hit that button all files will be wiped from redbooth and you have no way of knowing if the backup will work. Who in there right mind would do this ? I have gone round in circles wasting so much time on email support, just hitting a wall of obstinance regarding this complete failure of service provision. There is no safe or sensible supported file backup service for this paid project management software. (unless you have time to download one by one…. )My advice: Do not touch this company with a bargepole. I am sorry for your troubles! Have you tried contacting Redbooth directly? Every interaction I have had with them has been extremely positive. They seem to want to make your experience as good as they can, so there might be something they can do. Redbooth as transformed our business development teams productivity and performance. Before Redbooth, we endured long staff mtgs that updated everyone on what happened leaving only minutes to discuss strategic and important topics. With Redooth, everyone knows status and state of everyone’s activity, we don’t need to sift through mountains of email. We now spend the vast majority of staff mtgs on how to drive the business forward rather than “wake driving”. We are much more productive and effective. Redbooth is an indispensable tool for us! I would give this site a minus-1 stars, if possible.There is NO help, after two days of writing back and forth the company finally agreed to give me a tutorial at 8:30AM my time.They also expected ME to pay for the international call. On their “help” website, they say to click on the gear-icon, which doesn’t exist. They also say to click on a sub-menu of the notifications-icon, which doesn’t exist. It is only by luck that you can view whichever side of the page you wish.If this site existed in the USA I would report them to the BBB. I’m sorry about the problems you encountered – they may have had something to do with being international, as I have never encountered similar problems using the Redbooth website in the states. Very poor customer service. There are multiple problems when trying to use the site and trying to get help is darn near impossible. The FAQ’s are seriously lacking and when I reached some guy named Josh, he said to send an e-mail to support and “they will get back to you in the next several days.” I explained my urgency, but he declined to help. I am the site administrator, and there is no help available either online or by phone. Great product. They have made changes in pricing (no free plan anymore, with starter package at $49/m when billed annually or $62.50 when month to month and up to 10 users: that means if you have 10 users is a better deal than other plans that charge about $30 per user). The biggest disadvantage is the task orientation and manual work related to keep updating and following up (in contrast with comindware or liquidplanner). Redbooth has also a timer integration that makes it a much desirable product. Other integrations are there and actually has probably the most integrations than any other project management software.